There are 4 Assisted Living Facilities in the Belle Fourche area, with 3 in Belle Fourche and 1 nearby. Caring.com has helped thousands of families find high-quality senior care. To speak with one of our Family Advisors about assisted living options and costs in Belle Fourche, call (855) 863-8283. Belle Fourche is the county seat of Butte County and home to a sizable senior demographic — about 18 percent of the population is aged 65 and older. There are three assisted living facilities in Belle Fourche with six more located within close proximity. These facilities are licensed and regulated by the South Dakota Department of Health. Seniors can expect to receive assistance with activities of daily living in these facilities. Some are also equipped to offer more specialized care for seniors with dementia or Alzheimer’s or a disability. The cost of living index in Belle Fourche is 86. This is considerably lower than the national average of 100. With reduced living expenses, seniors may discover they have more funds in their budgets to pay for care at an assisted living facility. Unlike many states, South Dakota does not tax social security benefits. Again, this savings will leave seniors with more money in their budgets for other expenses. Belle Fourche is home to outstanding medical facilities, including the Belle Fourche Healthcare Community, in the event of medical emergencies or illness. The city of Belle Fourche features an array of resources for seniors, including the Belle Fourche Senior Citizens Center, which offers fitness programs, line dancing, bingo and games and other social and recreational activities. The Belle Fourche area offers many cultural attractions that seniors may enjoy such as the Tri-State Museum, Belle Fourche Area Community Center and Robert Clements Gallery. While the July average high of 89 degrees in Belle Fourche keeps summers hot, they may prove comfortable to many seniors due to a lack of high humidity. On the other hand, the January average low is 13 degrees. Coupled with blustery winds, these freezing temperatures may make commuting around the city difficult for some seniors. Assisted Living costs in Belle Fourche start around $0 per month on average, while the nationwide average cost of assisted living is $4,000 per month, according to the latest figures from Genworth’s Cost of Care Survey. It’s important to note that assisted living rates in Belle Fourche and the surrounding suburbs can vary widely based on factors such as location, the level of care needed, apartment size and the types of amenities offered at each community. 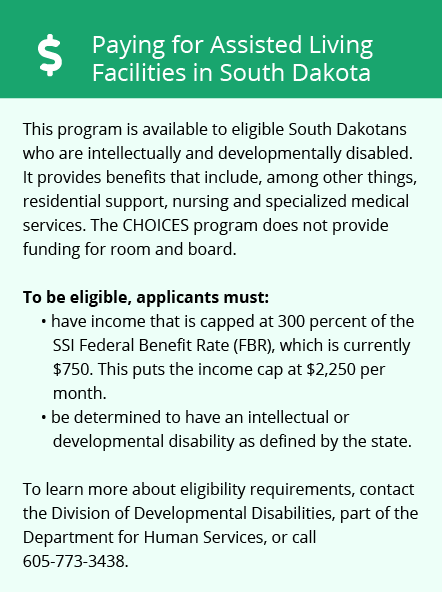 Though not all states offer financial assistance for assisted living facility care, the state of South Dakota does. 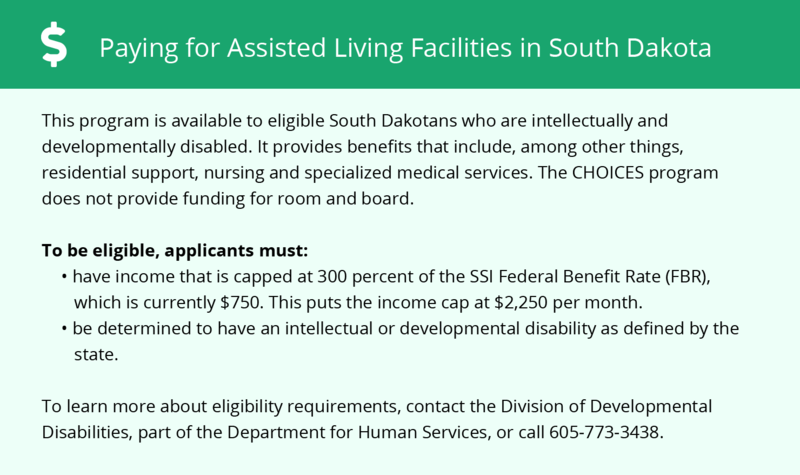 The South Dakota Medicaid Home and Community-Based Options and Person Centered Excellence (HOPE) Waiver provides financial assistance for care at an assisted living facility. Even so, there is a cap on available annual funding. Qualifying seniors may be placed on a waiting list for these funds. Seniors who are veterans may qualify for the Aid and Attendance benefit to help pay costs associated with assisted living facility care. Learn more about these programs, plus who’s eligible, on our Assisted Living in South Dakota page. For more information about different ways to finance assisted living, visit our Assisted Living in South Dakota page. Belle Fourche and the surrounding area are home to numerous government agencies and non-profit organizations offering help for seniors searching for or currently residing in an assisted living community. These organizations can also provide assistance in a number of other eldercare services such as geriatric care management, elder law advice, estate planning, finding home care and health and wellness programs. To see a list of free assisted living resources in Belle Fourche, please visit our Assisted Living in South Dakota page. Belle Fourche-area assisted living communities must adhere to the comprehensive set of state laws and regulations that all assisted living communities in South Dakota are required to follow. Visit our Assisted Living in South Dakota page for more information about these laws.